A few years ago, my husband revealed some truths about our marriage that sent me to the second rock bottom of my life and brought LOVE WARRIOR into the world. To come see Glennon at a city near you, check out her full speaking schedule here. Subscribe to the newsletter to get the most recent news and updates. 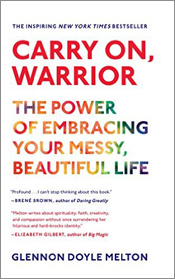 Glennon Doyle is the author of the #1 New York Times bestselling memoir Love Warrior, which was selected as an Oprah’s Book Club pick, as well as the New York Times bestseller Carry On, Warrior. Glennon is also the founder of Momastery, an online community reaching millions of people each week. She is the creator and president of Together Rising—a non-profit organization that has raised over Fifteen Million Dollars for families around the world through its Love Flash Mobs, which have revolutionized online giving. Glennon is a sought-after public speaker and her work has been featured on the TODAY Show, The Talk, OWN, and NPR and in The New York Times, Ladies’ Home Journal, Glamour, Family Circle, Parents Magazine, Newsweek, Woman’s Day, and in other television and print outlets. Glennon lives in Florida with her family. Copyright © 2019 Glennon Doyle, All Rights Reserved.